I greatly enjoyed Peter Thiel's new book, Zero To One, Notes on Startups, Or How to Build the Future. While the book and its author are well documented, I write here with a few of the insights I found particularly useful. Peter is clearly a fan of two by two matrixes. One of my favorite in the book is below. The definite optimist has a concrete plan for the future and strongly believes in that future being better than today. 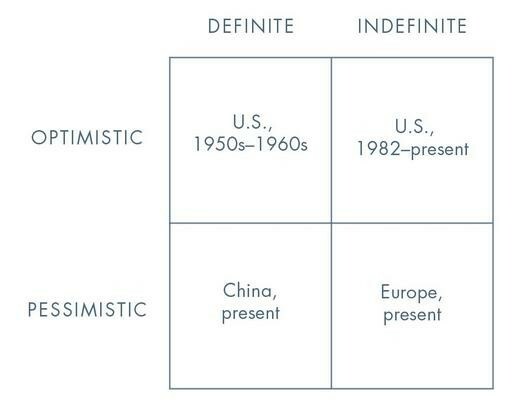 The indefinite optimist is bullish on the future but lacks any design and plan for how to make such a future possible. The definite pessimisthas a specific vision for the future but believes that future to be bleak. The indefinite pessimisthas a bearish view on the future but no idea what to do about it. Peter makes the claim that incrementalism is rife in start up land and that people are guilty of indefinite optimism - while lacking a specific design and vision for the world, they are highly confident in the process for arriving at a positive outcome. Trust in the process, take little bets to learn, leverage optionality, and arrive at a place of market-fit. The definite optimist on the other hand has a specific vision for the future, i.e. Steve Jobs, that does not rely on customer feedback but rather on a radical, new design for a better world. In Peter's words, definite optimists turn a zero into a one, i.e. the process of creation. In today's start-up landscape, lean and agile development processes dominate. The goal is to get to Minimum Viable Product and to iterate to success one release at a time. There is, by definition, no concrete, long term plan but the goal is to learn, based on empirical, customer driven data, how to develop something valuable. The long term planning associated with water fall development, MRDs and PRDs, are pejoratively viewed. Iteration and the lean process are gospel. Peter's challenge is that the indefinite optimist thinks too small, is reliant on process rather than design, and is hostage to randomness rather than declarative world views. His critique challenges convention and belies his concern that people in the valley, perhaps tarred by previous tech downturns, are thinking too small. He'd like founders to be more like Elon Musk, i.e. be brave enough to create a new world. In June, I went to my 20th college reunion. In talking to my friends, the people who appeared the happiest, the most alive, and responsible for "great work" were those who are mission driven. My good friend, Dr Jay Bradner, is the poster child for the definite optimist. His mission...beat cancer. Jay wakes up every day energized to change the future and his energy and passion are inspirational. With four cancer drugs to his name, he is creating a new reality. I believe that too many of us are guilty of indefinite optimism. We believe that the future will be better but we are not sure why, nor do we have a specific vision of the future that we are 100% committed to helping realize. Great educators, coaches, doctors, businesspeople, etc go all in on a definite vision of a future world and put their heart and sole into executing on a specific design that will enable that future. In the absence of a design on the future, we spend our time making incremental improvements, data driven to be sure, but don't apply our passions and energy on creating new futures. Incrementalism, eking out marginal efficiencies, is all well and good but not going to lead to the act of creation. Without a concrete plan for the future, life becomes a random walk whereby circumstance, rather than conviction, helps explain what we do and where we do it. While arriving at a design for the world is clearly not easy, it is helpful to recognize which one of the four states above represents where you are in life. Are you hopeful for a better future but not sure why or how to make it happen? Are you betting on optionality, keep your options open, don't go all in, and bet that process and luck will get you there? Or are you determined to shape the future to your vision? Or are you bearish on the future and tend to feel your efforts won't make a difference? Finally, Peter argues that not everyone should strive to become a founder. Given the power law distribution of start-up outcomes, the more reasonable path may well be not to start something, but to identify a company powered by definite optimism and to lend your talents and energies to them; Thiel's ex SpaceX, Tesla, Facebook, Google, etc.